For a list of this Branch's Future Events, as well as reports from more recent Past Events, click here. Another beautiful day at La Casita in Pasadena with members, board members and friends discussing garden-related topics over a bring-and-share lunch and exchanging plants. 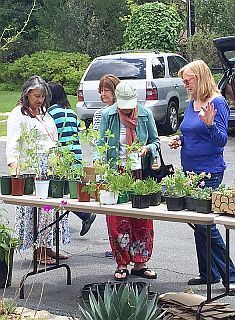 See our past Annual Plant Exchange and Lunch, May 2016 below for descriptions of this gathering place. Our Southern California Branch hosted the annual meeting of members from around the world. The 2017 Annual General Meeting (AGM) started on Thursday evening with a welcome reception at the Pasadena Museum of California Art preceded by a stage-setting talk by two of Southern California’s most noted horticulturists, Nan Sterman and Mike Evans. 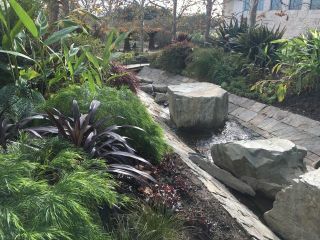 On Friday, we visited public and private estate gardens in and around Pasadena. On Saturday we had a full day, visiting the Nature Gardens at the Natural History Museum, private gardens in Hancock Park and Pacific Palisades, and the Getty Center. Sunday included a visit to the Huntington for a tour of the California Garden, the General Assembly and a festive farewell dinner held at a noted Mexican restaurant. 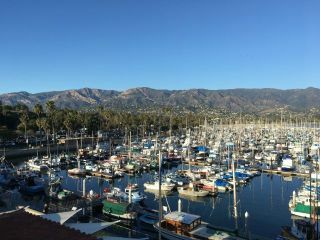 An optional pre-AGM trip in Santa Barbara began on Monday evening and ended in Pasadena mid-afternoon on Thursday. 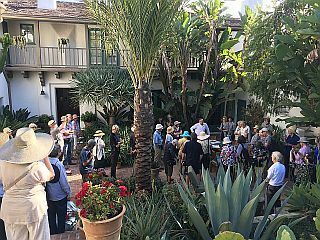 The tour included public - Lotusland, Casa del Herrero and Santa Barbara Botanic Garden – and private gardens plus a wine-tasting reception and historical tour of Santa Barbara. 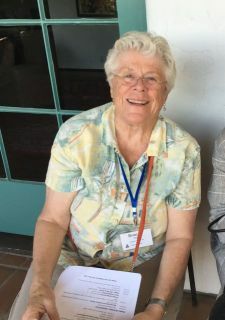 An optional post-AGM trip to Claremont was arranged on Monday, October 30 to see Rancho Santa Ana Botanic Garden and other special gardens with renowned professors Bob and Peggy Perry. We very much want to extend our appreciation to the many friends, Advisory Board members and members who were involved in making this AGM a very successful, inspiring and fun event. Below is an overview of the days spent together experiencing and learning about California’s mediterranean gardens. Santa Barbara Welcome Reception by the hotel’s pool. This included a visit to Lotusland followed by a picnic lunch, then visits to architect Ken Radtkey’s and landscape architect Susan Van Atta’s LEED-certified home including a roof garden, and to Isabelle Greene’s personal home and garden, as well as a Santa Barbara historical bus tour with Bob Dickey including seeing the Santa Barbara Mission Rose Garden and Alice Keck Park. 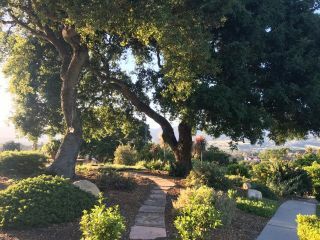 At the end of our day, we visited a private garden with a spectacular sunset view for hosting our wine tasting reception. There were visits to Casa del Herrero, five private gardens including a swimming-pond garden designed by Isabelle Greene and another garden she currently redesigned, an extensive succulent garden with water conservation methods by Fred Hunter, a 2-acre exquisite Mediterranean-style garden personally cared for and designed by the owner for 30 years and Jeff Chemnick’s cycad grower’s garden. We went to the Santa Barbara Botanic Garden for lunch, and to the Santa Barbara Pier for a late afternoon refreshment. Returning from Santa Barbara, we visited a private hillside garden in Carpinteria with a rich palette of drought-tolerant plants and native shrubs overlooking the Pacific Ocean, then Patina Farms in Ojai for lunch (see their blog and Instagram). The registration for the AGM was at the Westin Hotel in Pasadena California. 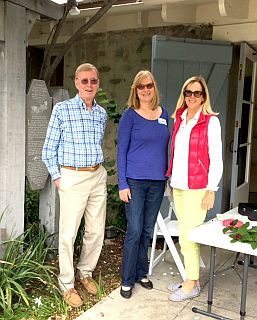 We heard garden talks by Southern California Advisory Board Members Nan Sterman: A Growing Passion, and by Mike Evans: Tree of Life Nursery before our Welcome Reception was at the Pasadena Museum of California Art. The first full day of the main meeting took us to the Arlington Gardens in Pasadena, created by community effort. The next stop was at Nuccio’s Nursery in Altadena with Tom Nuccio, famous world-wide for their camellias, followed by a visit and lunch at the LA Arboretum with Richard Schulhoff and Jim Henrich. We visited four private estate gardens including a garden with tough native grasses,100 rose plants, cut-flower and vegetable gardens, a George Washington Smith designed house and mediterranean garden with a charming rill linking a mudéjar-style tiled fountain. Next were visits to an Italian Revival house and garden overlooking the Arroyo, then to the Norton Simon Museum of Art’s garden designed by Nancy Goslee Powers, and ended with a reception at a spacious private garden overlooking the Arroyo at sunset. The day started with a guided bus tour through the City of Los Angeles, then a tour and breakfast at the Natural History Museum Nature Gardens with Carol Bornstein and staff. This was followed by visits to two private gardens in Hancock Park, including one with intimate separate areas and another garden with easy-going elegant entertaining areas throughout. 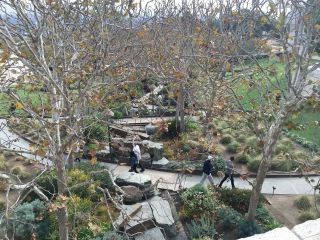 Next came a tour of the Getty Center Central Gardens and a visit to two private gardens in Pacific Palisades, one with lushly planted front and back courtyards. At the other garden we were offered refreshments in a spacious garden with orchard terraces, vegetable gardens and a hen coop. At the Huntington Botanical Gardens we were welcomed with a tour with Jim Folsom of the California Garden and breakfast before the General Assembly. After lunch there was a tour of the Desert Garden and time to explore on our own. In the late afternoon there was an optional talk by Richard Darke at the Arboretum. The Farewell Dinner was at Mijares Restaurant – the oldest Mexican restaurant in Pasadena. 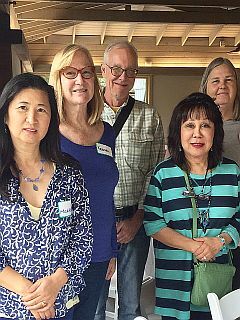 A day conceived by Bob and Peggy Perry with a morning visit to Rancho Santa Ana Botanic Garden including special tours of the impressive seed bank and a tour of the herbarium with Lucinda Dade. 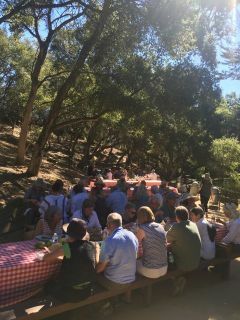 Lunch at Rancho was followed by tours of the historical and current landscapes of Scripps and Pitzer Colleges led by Bob Perry. Afternoon refreshments were offered at the Perry’s family garden. Our second annual plant exchange was held at la Casita in Pasadena. We had a good turnout and an educational round-table discussion. It was an informal time for us to share ideas and get to know each other better over a pot-luck lunch. We look forward to continuing this event. 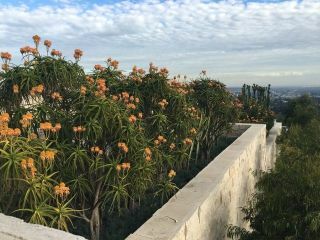 There was a large turnout for the Annual Meeting and tour of the Getty Center’s Central Garden. We discussed general business and offered a highlight of upcoming events for 2017, including the Annual General Meeting to be held in Los Angeles. 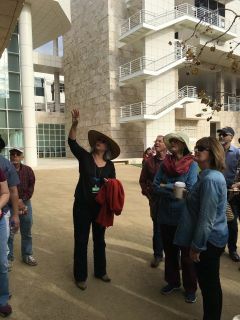 Brian Houck, manager of grounds and gardens for both the Getty Center and the Getty Villa, led our group on a tour from the Museum Courtyard down the west stairs through the Central Garden. His encyclopedic knowledge of the garden offered insight into the construction and maintenance of this landscape gem rarely given out to the general public. For instance, he told us the fountains were turned off for two years because of drought restrictions and they found that 10,000 gallons of water were lost each day in evaporation. He did say that the Central Garden is treated as a sculpture so it is exempt from the restrictions. He said that four years ago they applied one million gallons of water in three months for maintaining the health of the oaks on the 700 acres surrounding the Getty, something they haven’t done since. Planned attrition of some of the oaks was built into the plan. Brian and our docent Pam (an architect) recounted how Richard Meier’s garden grid system matches up with the architecture and that Robert Irwin’s garden plays off the grid system as a natural counterpoint. Nowhere is the dichotomy of the two sensibilities more apparent than in the garden’s various sycamore trees. 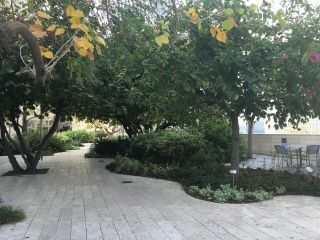 Meier’s courtyard trees are pollarded and tightly controlled, where Irwin’s Central Garden trees are left to branch naturally and develop their characteristic quirky structure. Meier’s sycamores have their bark shaved as well, so energy is put into growing leaves the size of dinner plates. Irwin, an Abstract Impressionist painter before he moved into the world of site works, saw the garden as a sculpture, where he would communicate ideas and emotions through art. He wanted the visitor to look down upon the garden and see it as a painting, then descend the steps (past the amphora-shaped rill termination known affectionately as the urinal) and be in and a part of the painting. This painting is heavily manipulated to give the desired effect. Case in point: Every fourth sycamore leaf is removed to give dappled shade to the visitor and garden below. The zigzag path leading down to the Central Garden intentionally makes the visitor stop, turn and look at the architecture and the garden space. It slows the visitor down, providing unique built-in COR-TEN and wood benches to examine the plantings and architectural details. Brian told us how Robert Irwin would describe his vision to gardener Jim Duggan in terms of the qualities he was looking for in a plant - glossy, fuzzy, smooth, red, etc. - and Jim would find plants to match his vision. Irwin and Duggan would wait a year and then revisit each plant choice to make sure it met their expectations. Irwin planned the garden to appeal to all senses: auditory (stream), scent, sight, and touch. Irwin “tuned” the stream during construction by adding, subtracting, and moving boulders to get the desired effect. After descending to the Central Garden, Brian described how one side of the garden is vegetable-focused and more natural, while the opposite side is focused on specimen plantings. Irwin’s signature is hidden behind the last stone installed on the project. 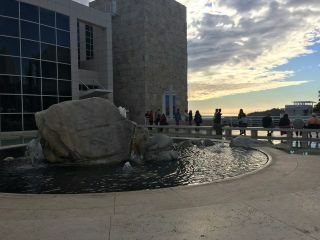 We all concluded the tour feeling that we had gained insight into the intense maintenance required by a landscape of that magnitude and significance, and into the inner workings of two intense and passionate artists: Richard Meier and Robert Irwin. The Southern California Branch’s first plant exchange took place Saturday, May 21, 2016 in Pasadena. The sun was bright, the wind warm, the guests smiling and La Casita was the perfect setting for a wonderful lunch. Gardeners found each other in a discussion that went on for several hours, and one realized that gardening is an obsession that must be indulged. So as our MGS Co-Branch Chair, Virginia Paca, said, it was quite wonderful. With an amazing variety of plants for the exchange everyone went home with something they really liked. Advisory Board Members Bob Perry and his wife Peggy, and Nicholas Staddon came with lots of great cuttings, and many others brought some real gems. The potluck buffet was just perfect and so casual in La Casita del Arroyo. People congregated inside and out for the first hour, then they helped themselves to a lovely potluck lunch inside La Casita. Everyone then did a little more plant picking outside afterwards. The plants left over were dropped off at the plant area at the Pasadena Jackie Robinson Center, and everyone felt good about that. The group was an ideal size as each person had a chance to speak and the conversation was easy to follow with commentary and observations from everyone. 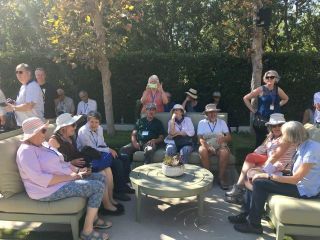 Each guest had an opportunity to get to know each other a little more, where they lived, and what their garden was like. We heard each other talk about the motives and impulses that cause us to have a garden, whether it be a collection of pots on a porch or an acre of foliage. A mystery plant was also presented and the Perrys identified it as a Calycanthus occidentalis, spice bush, with a chestnut-colored bloom and subtle spice-like scent. 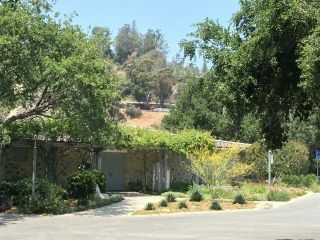 Lots of people talked about noticing birds and wildlife in the garden, such as the gardeners from Claremont, the impact of the drought as experienced on hillside slopes in West Los Angeles, the antique rose collection at the Banning Museum, or removal of lawns and their replacements in San Marino. There was a resounding YES, to having the MGS plant exchange repeated annually. And with that in mind, the date for next year’s plant exchange and potluck lunch will be announced as soon as scheduling is complete. 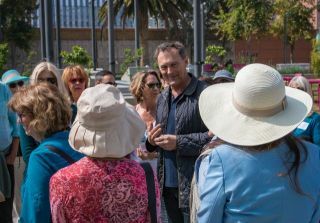 The MGS Southern California Branch toured and celebrated the mediterranean gardens in the heart of downtown Los Angeles’s public spaces. California is in the midst of a four-year drought, cyclical in nature, which has impacted the choices we make in our public and private spaces. 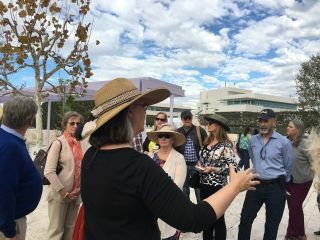 The downtown gardens we visited reflect these changes, emphasizing water-conserving gardens, the use of amazing drought-tolerant native and Mediterranean flora and are a roadmap to where we must go as our ecosystem changes. 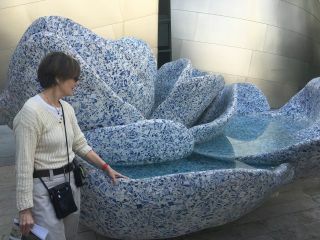 Our first garden tour was the rooftop garden of the Walt Disney Concert Hall, known as the Blue Ribbon Garden, designed by Melinda Taylor. Our extremely knowledgeable and engaging guide was Julia Newton, who continues her involvement in the smallest State Park (nearly an acre in size) through routine maintenance. Julia described how the intention of the design was to create a cool microclimate where trees and shrubs would bloom throughout the philharmonic season. Subtropical trees such as Hong Kong orchid tree (Bauhinia blakeana), Tipuana tipu, Erythrina, Tabebuia, Dombeya, Chinese pistache (Pistacia chinensis) - some of which were salvaged from other sites - form the structure and canopy for the repeating textures and patterns of the shrubs and perennials below: Pittosporum, Justicia, Rhaphiolepis, Plectranthus, Strobilanthes, Dianella and Ruellia, among others. Julia told us that Melinda Taylor likes to repeat different species within the same genus, so there is an underlying familiarity between plants, tying the design together. She also uses deciduous trees in the planting design, where their structure can be appreciated against the undulating architectural planes of the Concert Hall. 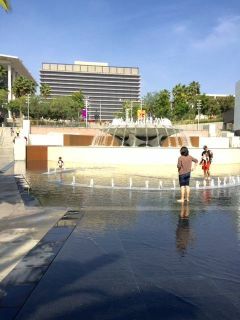 At the center of the garden is an intimate fountain designed by Frank Gehry and this is known as “A Rose for Lilly”. It is a tribute to Lillian Disney, who provided the initial donation for the Disney Concert Hall. She loved both Royal Delft porcelain vases and roses. The fountain forms a centerpiece within the sinuous paths throughout the garden. Knowing that the entire garden root structure is encompassed within five feet of depth gives even more appreciation for the technical challenges of the project and the dedication of the designers and staff who maintain it for the public’s pleasure. 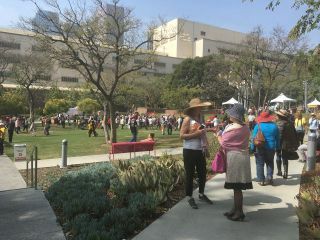 Our next tour was Grand Park, a vibrant outdoor community gathering place that extends from the Music Center to City Hall. Mark Rios of Rios Clementi Hale Studios, the landscape architecture firm who designed the park, led our tour with fascinating insights into the development and building of this new urban park. The park is a true expression of the multi-culturally diverse population surrounding it, where over 100 languages are spoken. This diversity is expressed in many ways, one of which is botanical gardens that represent where people come from. Plants are grouped together in six floristic kingdoms north and south of the equator, each with its own distinct fragrance to engage people through the deliberate and exaggerated sense of smell. There are many layers of engagement in the park so visitors can find something new each time they visit. Plants are arranged in large massings (minimum 100 to 200 of each variety) so the composition is easily comprehensible. The planting plan is strictly adhered to, so if a plant fails, it is replaced exactly in kind so the intention of the design is not lost. 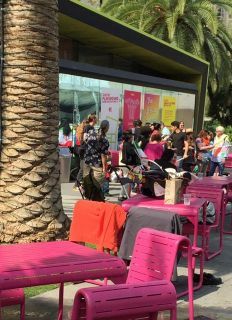 The furniture is a joyous pink, which research pinpointed as the most prevalent color of cultures around the equator, and this gives the park its distinctive look. Thirty percent of the furniture in the park is fixed and 70 percent is moveable, which Mark Rio said is critical to giving park visitors the flexibility they want for social engagement. A huge dining table at the community terrace is where the community “breaks bread together”, illustrating the design concepts of collage, tapestry, and intersections between cultures. The park planning process involved 75 community meetings over two years. Construction took another two and a half years and was very complex, involving limited soil on top of parking garages under the site. The park is highly programmed by the Music Center and one of the requirements was that the space be flexible and easy to host various events. To that end, there are 24 media hydrants throughout the park where hi-tech audio and visual equipment can access power. After this inspiring tour, the group walked down to the Grand Central Market for lunch. “Grand Central Market, a downtown landmark since 1917, brings together the cuisines and cultures of LA.” A fitting conclusion to our DTLA tour.